West Bengal Joint Entrance Examination Board has announced that the WBJEE 2019 Application Form is available from 26 December 2018. The applicants can do the changes in an Application form from 23 – 25 January 2019. And the last date for downloading confirmation page is 22 January 2019. The candidate must also check if he or she is eligible to appear for the exam or not before applying. 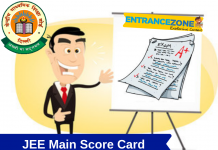 The West Bengal Joint Entrance Examination Board was established in the year 1962 with the aim of carrying out examinations for Entrance into the Undergraduate programs offered in the state. 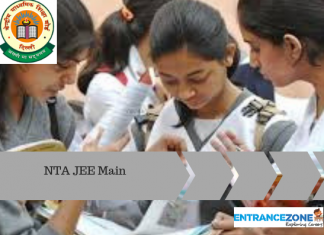 WBJEE 2019 will be conducted on 26 May 2019 for admission into the Private and Government colleges of West Bengal. Candidates have to apply online for this exam. Latest Update: WBJEE 2019 Online Application Form correction has been started from 23 January 2019. Last date of correction is 25 January 2019. Check details here. The WBJEE 2019 Application Form has been released. The Application Form of WBJEE 2019 has been available from 26 December 2018 to 22 January 2019. Read the article below for all the information regarding the WBJEE 2019 Application Form. Given below are the steps to fill the WBJEE 2019 Application Form online. The form will be available online on the official website of the WBJEE Board. Select the link named ‘Fill application form’ following which you will get the redirection to the form. The candidate needs to Register first before filling the form. However, if the Registration is already complete, the candidate just needs to log in after entering the necessary credentials and submit the form. After all the mandatory information is complete, the candidate will get a unique application number for future reference. 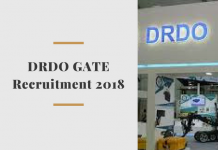 Some of the generally required information for the application form includes the candidate’s as well parent’s Gender, Date Of Birth, Category, Address, Academic details, Exam center, Permanent residence and a Center of other details as well. The applicants can then submit the application form along with the fee via Net Banking and Debit card or the Offline mode via Challan. Age Limit: The Applicant age should be 17 years as on 31 December 2019. For admission to the degree level Marine Engineering course, the upper age limit will be 25 years as on 31 December 2019. Applicant must have passed the 12th or equivalent examination from the recognized board. Must have Physics and Mathematics along with one of Chemistry/Biotechnology/Biology/Computer Science/Computer Application are the compulsory subjects. Candidates must pass individually in all the three subjects. It is necessary to obtained 45% marks (40% in case of reserved categories) in three subjects taken together. Applicants should qualify the 10+2 exam from a recognized board. Candidates must pass with Physics and Chemistry along with any one of Mathematics/Biology as important subjects with individual pass marks in all the three subjects. Applicants must secure at least 45% marks (40% for SC, ST, OBC-A, OBC-B, PwD category) in all 3 subjects taken together. ID Proof such as Voter ID/ Passport/ Student ID/ Pass Book etc. Read all the instructions prior to filling the form. Stay up to date with the college updates. Contact the person-in-charge in case of any confusion. Candidates must make sure the information they provide is true and correct. Forms with false information will be rejected. While uploading documents and images, adhere to the specified format and size. Forms with poorly scanned images will also be rejected. Make sure the signature is not in CAPITAL letters. Upload your signature in running handwriting. Candidates applying through quotas must provide all relevant Documents at the time of Document verification. 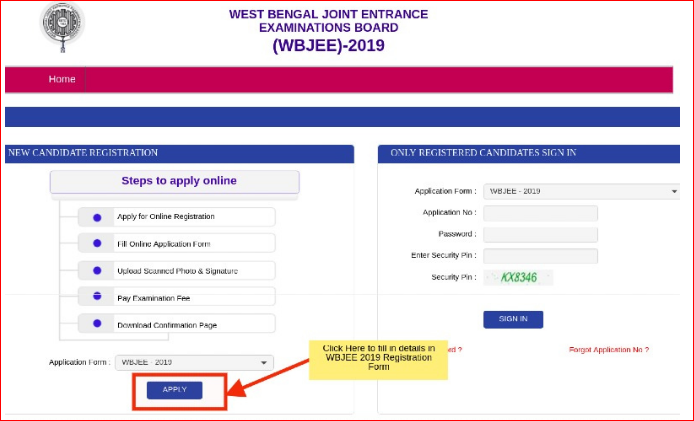 Keep a copy of the confirmation page once you have filled WBJEE 2019 Application Form. 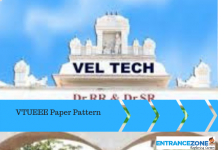 Registration for WBJEE 2019 is all online. No documents will be sent to the Board. Question. How can I access my WBJEE login account if I forgot my login password? Ans. At the login page of WBJEE, click on ‘Forgot Password’ an email will be sent to the registered Email Id to reset the password. Question. I belong to the Reserved category. And I have selected the General category by mistake while applying for WBJEE 2019. Can I make changes to my category? Ans. Yes, you can change your category when the Correction Window is open. Question. 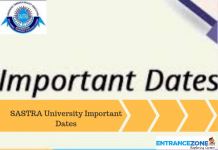 When is the last date to submit WBJEE 2019 application form? Ans. The last date to submit WBJEE 2019 Application form is 22 January 2019.